Bennett York just needs $140 Million to get Hattiesburg's poop and stinking rich. Any investors out there? "Betting on the Come" is derived from a gambling expression and means you don't have what you want or need, now at the moment; but, you are betting or hoping you will have what you want or need when the time come. On Monday June 2nd, Groundworx provided the city with an update on their planned construction of the proposed $140 million dollar waste water discharge system. An attorney for Groundworx, Andy Taggart announced that Groundworx is ready to begin construction on 300 miles of irrigation pipe, except for one, tiny thing. Groundworx doesn't have $140,000,000 to build the system and can't get funding! 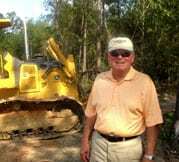 Taggart then threatened to sue the city if the city didn't raise revenue (taxes or fees) to show that Hattiesburg can afford the $16,600,000 per year system; thereby assisting Groundworx in getting their bond issued. The problem is, according to attorneys assisting the Hattiesburg Patriot, the contract doesn't require the city to do so. On the contrary, the contract specifically states the following. Groundworx is in serious trouble of being in default of their contract, since they have not been able to obtain financing. In order for Groundworx to get financing they need to issue a bond. In order to get a bond issued the underwriters need to see that the city has the money to pay the $16,600,000 per year to pay for the project. The problem for Groundworx is that whoever drafted the contract overlooked one very important clause. The clause that requires the city to raise rates to demonstrate to bond underwriters that Hattiesburg can afford these annual payments. The cost of the land application is enormous. At a cost of $16,600,000 per year, that's an average cost of $212.00 for every man, woman, and child in Hattiesburg and Petal as well as the total student population at USM. With 16,000 active water meters that's over $1,200.00 annually per meter! The worst of it is that MDEQ and DEA have both approved advanced treatment methods using our present lagoon system, which would save hundreds of millions of dollars. Some members on the city council are pushing hard to buy land and spend the money, placing the burden of this unnecessary project on the backs of average citizens.